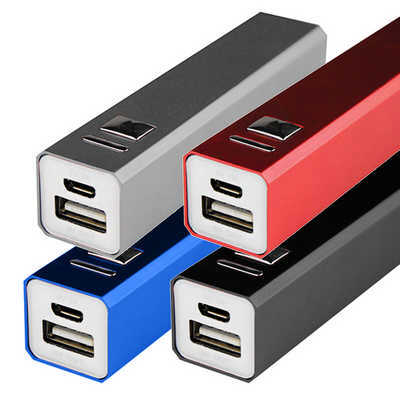 The Quality Aluminium Square Shape Power Bank. 1. Rechargable lithium battery power bank, a portable emergency charger with a power on/off button. 2. Aluminium case. 3. Battery type: li-ion. 4. Capacity: 2200mAh. 5. Charging current mobile phones with one charging cycle. 6. Not suitable for higher draw tablet devices. 7. can be charged upto 300 times. 8. Input: 5V/1A. Package contents: power bank x 1. cables x 1. product manual x 1. Item Size: 93.5 mm x 22 mm x 22 mm,. Package: white box. Colour Range: red, blue, silver, black. Decoration Area: Button side: 13 mm W x 50 mm H. Non Button side: 13 mm W x 60 mm H. Price includes : 7 Days 1c/1p printed or engraved. Setup is not included, please ask for a final price from your sales representative.